People keep asking me if i plan to stay in DC, and it makes me laugh. Sometimes I laugh because after living in 10 countries, the idea of settling in one city, let alone one country, is still unfathomable. I don't want to be a tree rooted to one place only; I want to be the wind, caressing the curves of earth and moving at whatever pace I will across the world. I want to be the water, part and not part, soaking up and giving back, but separate and omnipresent in essence. I love words and the power they hold in their precision. I love knowing that there are words for the way the earth smells after a storm, and for those who live on the same meridian, but on opposite sides of the equator, so that their noon-shadows fall in opposite directions. But there are moments that words don't reach and gestures that feel like floodlights after centuries of spinning in darkness. Being articulate matters, but to me, knowing how to listen and how I carry myself into conversations is just as important as knowing what to say. I think at the heart of all of my searching for and stumbling over words, all of my wrist-twisting and hand-sweeping, I want to understand and be understood. My life changed forever when I became a father ten years ago. I finally learned how to “give” rather than “take.” I replaced the word “selfishness” with “selflessness.” I discovered what “love” is and how to experience “joy.” Life is good! I don’t need any material things in life to be happy. I am content with my life as-is today! I love the fact that my son Matthew is honest, fun-loving, kind to a fault, generous, and has Jesus in his big heart! As much as I love Matthew, I feel great to be loved by him in return. I was incredibly anxious about doing this photo project. The idea of having close up pictures taken of me, just me, gave me knots in my stomach because there would be no way around exposing my (self-perceived) physical flaws and imperfections. Our society places too much emphasis on outward beauty. This is combined with the related issue of pressure to never show vulnerability; we always have to look and act like we have it all together. We’re too hard on ourselves and on each other. I think the connections we make with other people by showing our flaws/our imperfections/our vulnerability are part of what makes life worth living. Doing this photoshoot with HiUan was a reminder of that for me. Being vulnerable and saying yes to this project gave me the opportunity to spend time connecting with my beautiful friend through her artwork. "The Dude abides. I don't know about you, but I take comfort in that. It's good knowin' he's out there. The Dude. Takin' 'er easy for all us sinners." Living and working in Washington, D.C., it's easy to get caught up in the hustle-and-bustle and the constant need to feel productive. There is an ever-present temptation to fill one's calendar with tasks, meetings, appointments, etc. Even ostensibly fun social gatherings must be scheduled weeks in advance. If you're busy, the thinking goes, you must be on the right track. In such a context, I need reminders that it's OK to slow down and simply "be." Kingman Island, where these pictures were taken, is a little-known slice of nature among the urban concrete where I often find such reminders: the ebb and flow of the tide, a lonely heron flying low across the water, a radiant pink and orange sunset. It is a place to relax, refresh and rejuvenate. May all of us find similar places to abide like The Dude. I am a work in progress. Every time I feel like I know what's going on or I have things under control, God throws a wrench in my plans to let me know the truth: I do not run the show nor does the world revolve around me. I am constantly being challenged as a mother, teacher, daughter, wife and citizen. I feel like I fail more than I succeed, but that continuing to try will work out in the end. I am not a complete optimist, but I try to see the good in situations, people, and myself. I've learned that I must keep learning. Bella is our eldest daughter and middle child. Her first name is Joanna, after her paternal great-grandmother and maternal aunt. She has beautiful eyes that can fill up with crocodile tears at a moments notice, but also become smily-face-like when she is filled with pure joy and excitement. Bella is the most empathetic person we know. She instinctively knows when someone is happy, sad, or nervous. She shares joy in an infectious way, comforts those in pain with gentleness and sincerity. She will keeps you at arms length until she knows she can trust you, but once she decides that you are family, she will be fiercely loyal. We are happy to celebrate Bella today! I don’t like change, especially geographical change. In my college days my dream was to live in my small, southern town for the rest of my life. Now, I’ve lived in 8 places in 3 countries and see how God can use change to bless and enrich our lives. Each place brought new friends, new opportunities, and new challenges to learn more of God’s faithfulness on this walk of faith. In each locale He has used change to bring growth and to explode my horizons. I don’t like change, especially geographical change. In my college days my dream was to live in my small, southern town for the rest of my life. Now, I’ve lived in 8 places in 3 countries and see how God can use change to bless and enrich our lives. Each place brought new friends, new opportunities, and new challenges to learn more of God’s faithfulness on this walk of faith. In each locale He has used change to bring growth and to explode my horizons. “I love ice cream!” is what I think about at Yards Park (since we're here taking photos). I look back at these past four years and I can not believe I'm still in this city. I was supposed to leave after one year. The majority of my time here, I have lived East of the River, which is an extreme culture shock from Pleasanton, California. I'm learning that living outside of my comfort zone, is the best thing I did, for me. It's where I've learned, still learning, the most about myself and the people around me. I'm on this continuous journey to live life, well. Growing older, seeing life as generations overlapping, carrying on, is an awesome experience. The decisions that I made when young seemed random or inconsequential or just preferential, but they impacted those who are coming after me. It is important what I was and what I did, who I am right now, and what I will be and do in the future. Birth family and the many others that God has given me are a context to help me appreciate what I am becoming. I am thankful! I left Niger (not Nigeria) and came to the US for college in July 2013. I never knew that my "family circle" would increase exponentially with people from all over the world, with different experiences! Acknowledging that family is one of the most important aspects of life and knowing that I have a "double family" - a really huge one - that truly loves me, I can say that I am the luckiest and happiest person on Earth. I am just thankful to God for each and everyone of them! 5x5x5 Target Gallery at Torpedo Factory! In a new Target Gallery exhibition, artists were challenged to express themselves in a work of art that is no larger than five inches in any direction. 5×5(x5) is an all-media exhibition featuring little works that make a big impact. I made this quilt for my daughter last winter. I am in the process of quilting my son's quilt, and have the fabric for my youngest daughter ready to go. I am planning to finish my son's quilt soon, so come back and look for it later in January! 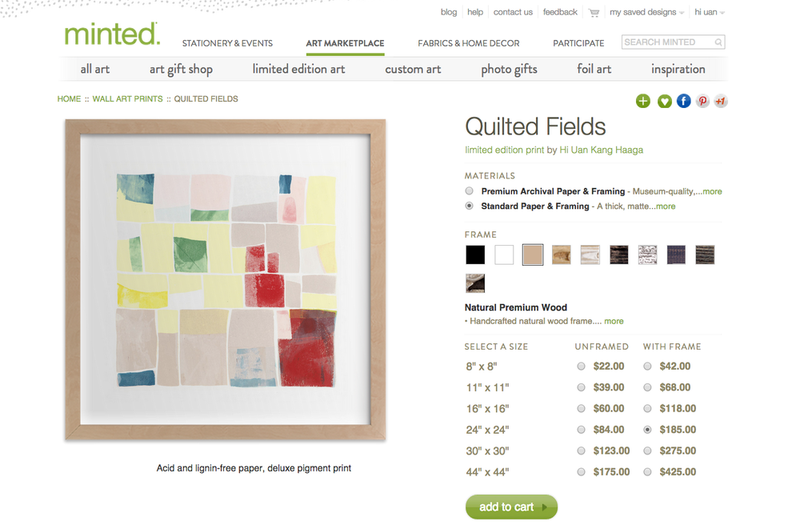 I am thrilled to announce that my work has been chosen by Minted to be sold in its Marketplace! I have one of my prints "Quilted Fields" and a fabric "Many Moons" available now!